As a high traffic area the kitchen has a very important role to play and so it’s important you dedicate plenty of time and thought into finding the right product for the floor. 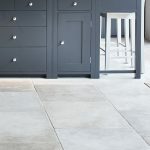 However, the options are vast, and too much choice can be debilitating so we’ve done some of the hard work for you and selected five natural stone floor tiles that will work in any kitchen. The natural, neutral shades of our Classic Dijon Limestone Tumbled floor tile compliments any style of room from country to contemporary. The variety of tones in this beautiful stone, which range from a pale grey to golden honey, will suit a kitchen of wooden shades or a modern and sophisticated grey scheme. The tumbled edge gives character to the tiles and texture to any kitchen. These tiles are suitable for both walls and floors. For a floor with a unique character then consider our Antique Terracotta These tiles are sourced from all over Europe and so each batch will vary in colour and exact size. 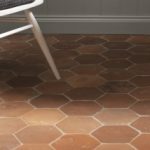 These stunning terracotta tiles are available as hexagonal, rectangular or square tiles and look their most charming in a neutral kitchen, which allows their warm tones to take centre stage. 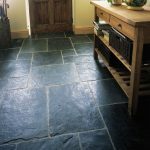 The beauty of our Trevail Slate Riven flagstones is their ability to bring a beautiful aged look to any kitchen, as though they’ve been there for centuries. Perfect for a property that wants to retain a sense of tradition. Their blue-black appearance is impressive and their rough cut texture adds a relaxed and rustic feel. These tiles come in a variety of large format flagstones. Our Dorchester Sandstone Tumbled is a neutral pale beauty of a stone with a variety of ivory tones that bring a sense of space into any kitchen and lightening all those darker corners. These stones would suit any style kitchen from dark grey contemporary to classic wood. 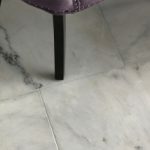 The Athena Marble Honed with its delicate grey veins looks fantastically sleek and luxurious on any floor. This cool stone is timelessly elegant, adding a sense of luxury to any kitchen; it looks stunning with grey or blue coloured furnishings. This tile is perfect for kitchens that will undergo heavy use. 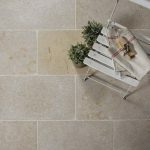 Natural stone tiles not only look stunning but they will add a sense of grandeur to any home, emphasising the feeling of space and light and blending effortlessly with the surroundings. So, whether you put them in a mansion or a maisonette, natural stone floor tiles will make an impressive addition to any kitchen, adding style, value and sophistication that will make every project a success. Take a look at our full range of contemporary kitchen floor tiles and traditional kitchen floor tiles.